Not what you may have expected on this page? 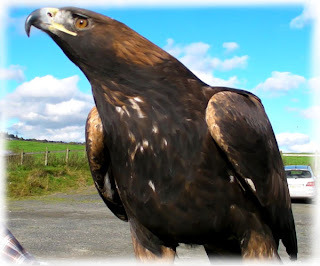 Well, this is Axil, the Golden Eagle. He was brought to Gigrin as his owner wished to watch the red kite feeding spectacle. Something in the region of 350 red kites are now coming in for lunch each day so we have increased the weight of meat being fed again, by another 20kg. There is now 70kg/day being fed, and this is all being eaten by the end of the afternoon. 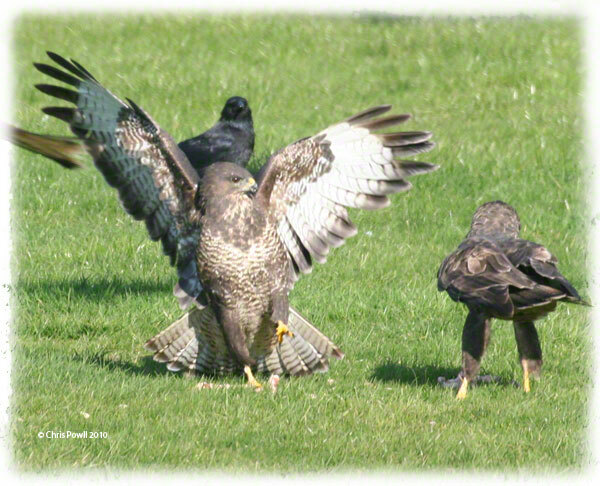 Buzzard numbers have also increased despite often being the target of red kites who, probably, think that their feathered cousins have the choicest meat on the field. Two of our red kite feeding hides are undergoing major refurbishment - they each have problems with the roof. One of the large hides (48ft) and one of the smaller hides (24ft) are each to have their entire roofs replaced. Work will be cease each day at lunch time so as not to disturb the kite feeding. Not that the kites would take too much notice now that the weather has cooled - they are plunging in for food as soon as it is put out and have no time to wonder where particular noises are coming from. Colin has been feeding the kites more often than usual, due to my having hurt my back, and will again be feeding days on end when I disappear for a break next week, by which time I hope to be fit again.. The Clocks will be changed week on Sunday (31st October) - they will go back an hour and, as we are unable to tell the kites of this change, the kite feeding will then be at 2pm for the rest of the winter.